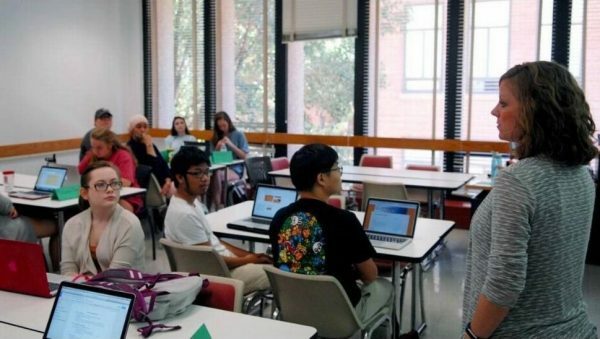 That finding, and others, are highlighted in a report out this week that identifies gaps in the 14 UNC teacher training programs that prepare undergraduates to be teachers. The study also recommends changes to beef up student teachers’ classroom experiences, familiarity with state standards and ability to use research-backed methods to teach reading. Thirty-seven percent of teachers in the state’s public schools are graduates of the UNC system, and they generally have better evaluations and higher pupil achievement than teachers who come from elsewhere. Still, the report found deficiencies. UNC President Margaret Spellings, using a grant from the Belk Foundation, commissioned a group of experts in reading instruction to, as she put it, “look under the hood” of the education schools. Consultants met with education deans, faculty and students, examined data and reviewed course curriculum to come up with a snapshot of teacher training. The reviewers did not pass judgment on individual programs but identified trends across the system. The report recommends a number of steps for the UNC system to review all courses, provide professional development for faculty, increase student field experiences and recruit better students into teacher programs. If the recommendations are carried out, the state’s public universities could see a top-to-bottom remake of teacher education programs. The review comes at a time of increased scrutiny of teacher education programs in North Carolina. Last year, the legislature passed a law that sets out new criteria for all programs, new licensure policies and more stringent accountability measures. The legislation called for report cards on teacher education programs, and a new commission that will oversee standards.